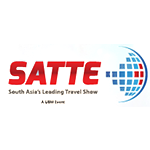 "South Asia’s Leading Travel Show"
SATTE stands as the internationally acclaimed travel and tourism exhibition across India. It is undeniably the most prestigious travel and tourism exhibition in India. Over the last two decades, it has successfully showcased India’s tourism potential to the world by bringing the global tourism market to India. The role of SATTE has always been to provide an effective marketing and advertisement tool portraying India as a global tourist destination through promotional campaigns that project India as a whole. SATTE is a leading event in South Asia, from every aspect, including convenience and professionalism. Thank you for asking. The Fair by and large was impressive. However, there was total chaos due to lack of space; could not move around without shouldering. It should have been spread out in multiple halls rather than restricting to limited space. It was curious to observe the crowd around the booths of foreign countries. The gulf presence in the fair was especially remarkable. Presence of participants was amazing. Other arrangements were comparatively satisfactory. While thanking the Organizers for everything, it is also expected that going forward they will look into the space problems. More for organisers... Check on shuttle service issues... Lot many people had complaints about it, although it was free but was not well organized... Knowing that evening traffic will be there no planning for time schedule was don't in such a way that vehicle movement is smooth and available every 15 minutes... And because of that people had to wait for more than 35-40 minutes too... Even I had waited for 40 minutes in the evening and about 30 minutes in morning. The programme and venu was excellent ....the stall management was great ...Overall the programme was good ...however if the participation of domestic operators was not seen as such ....I was expecting mpre presence of domestic tour operators which i found to be less in number.Overall the programme was Great and i would definately like to attend in the future. Travel Agencies, Travel Agents, Telecom Industry, National / Regional, Tourist Organisations, State Government Tourism Departments, Tour Operators, Travel Agents, Hotels, Resorts, Adventure Tourism, Airlines, Car Rentals, Railways, Coach Operators, Cruise Lines, Maps, Guides, Travel, Accessories & Equipment for Camping, Biking, Trekking, Photography etc. Boutique room in Greater Noida,..